The enemy of our soul is steadily at work to bring distraction into our lives. If we can be distracted from using our God-given resources, the milk and honey of the word, we can lose the proper perspective of God's intended purpose for our lives. Hosea says "My people are destroyed for lack of knowledge: because you have rejected knowledge, I will also reject you, that you shall no more be priest to me: seeing you have forgotten the law of your God…." (Hos. 4:6). Isaiah says that the people of God have been robbed and spoiled; they are all of them snared in holes, and they are hid in prison houses……and none says RESTORE. (Isa. 42:22). When there is full restoration, there is a recovery of all lost ground. Remember the butler and baker of the King of Egypt. They both offended the King. An offence is an enticing stumbling block that results in side-slipping. Even if done unintentionally, perhaps because of ignorance, the error can lead the offender into a place of imprisonment. Because the butler and baker offended, they were placed in the prison. While in prison, they both dreamed a dream. Joseph, who was in the same prison, was able to interpret their dreams. To the butler, Joseph predicted that within three days, Pharoah would restore him to HIS PLACE and to the FORMER MANNER to which he was accustomed when he was the king's butler. (Gen. 40:13). For the butler to be RESTORED, a door had to be re-opened that was shut against him. He was restored fully to his original position. King Hezekiah (meaning, "strengthened of God") did that which was right in the sight of God. (2 Chron. 29:2). In the first year of his reign, Hezekiah OPENED the doors of the LORD and REPAIRED them. (2 Chron. 29:3). The doors of the LORD had been shut against Israel because of the sin and offences of Hezekiah's father, King Ahaz. Unfaithfulness on the part of their forefather's brought wrath upon the people and upon their land. This resulted in the people being taken captive and delivered to trouble. (2 Chron.29:8). Hezekiah rose up to turn everything around by re-positioning. 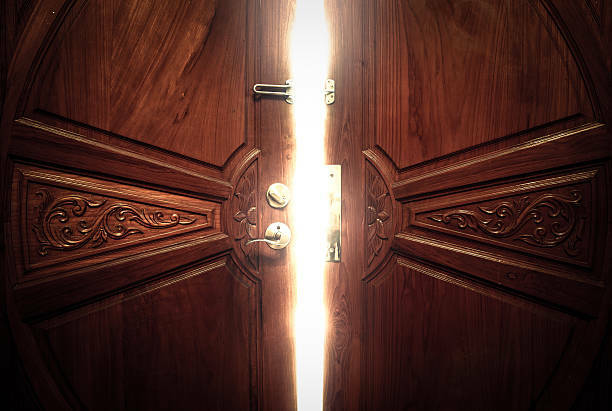 The shut doors were re-opened through repentance. The doors then had to be repaired from the damage done through error and ignorance. The Levites obeyed the commands of Hezekiah to cleanse themselves first and then the House of God. They cleansed themselves, the courts, the temple and set everything in its proper place before the LORD. This order and re-positioning opened the door for God to move SUDDENLY for the people. (2 Chron. 29:26). "And Hezekiah rejoiced, and all the people, that God had prepared the people: for the thing was done SUDDENLY" (2 Chron. 29:36). May nothing interfere with our breakthroughs.